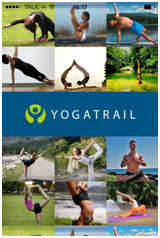 YogaTrail’s new app (for iPhone and Android) is different where it counts most. Starting with a gorgeous interface, the community-based, crowdsourced app continues to deliver past the stylish welcome page, and into the intuitive and user-friendly menus that make this app a winner. First of all, apps this functional usually cost money. YogaTrail has decided to maintain their ‘community feel’ by making the app absolutely free -- no “paid version only” functionalities, which truly is a stand out feature when it comes to database search apps. Secondly, the search feature is highly customizable with various filters to help you find exactly what you’re looking for -- be it a specific studio, teacher, or yoga workshop/event. From first use, it seems that every listing on the website shows up on the app. The third awesome feature of the app is that its extensive listings are worldwide, and cover most metropolitan areas of the globe, including smaller cities and towns. 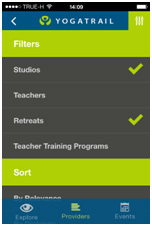 The directory is created and maintained by the actual teachers and studios in the listings, which are also free to create -- allowing for the most extensive worldwide yoga directory yet! Other sites and listings miss most of the smaller studios and teachers, focusing on the ‘corporate’ type studios, gyms, and fitness centers. Finding the best studio when you are travelling can be a challenging, if not impossible task (or at the very least, one that takes up a lot of time -- with multiple web searches that’s simply not effectively done on your phone). Let’s face it -- even us yogis want an easy way to get our asana on. Finding a studio shouldn’t be an act of tapas! 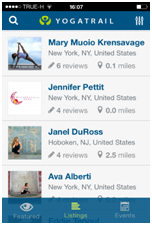 Having access to the robust teacher profiles on YogaTrail, in addition to studio listings, can really help you find a great match, and you can search based on distance and/or rating if you would like. The compact display allows quick and easy access to the important information you need. 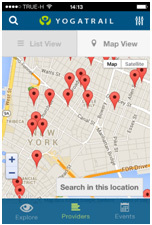 You can search by both ‘list’ and ‘map’ view based on either your current location or another address that you specify. I especially like the embedded Google Maps and how easy they are to expand and move around. The only thing that’s missing is a ‘get directions’ feature that would pop up driving directions using my phone’s GPS. While the main use of the app is still to find classes wherever you are, having the workshops and teacher training programs as part of the listings (like on the YogaTrail website) is still a nice touch. You can tell that the folks at YogaTrail are aiming to be as inclusive as possible, while other apps actually seem exclusive because of the limited listings available. After giving this app a whirl, I have to say that I’m thoroughly impressed, and can’t wait to use it the next time I travel. But I also know that it’s handy right here at home to search upcoming workshops in my area, with the convenience of my smartphone, if I feel like it. I give this app two thumbs upp and I highly recommend it to any yoga enthusiast, whether you are travelling or not!